Carl, an elderly balloon salesman, plans a long awaited trip to the jungles of South America by attaching numerous balloons to his house. This grumpy old man's real adventure is the relationship he forms with a young stowaway, Russell. 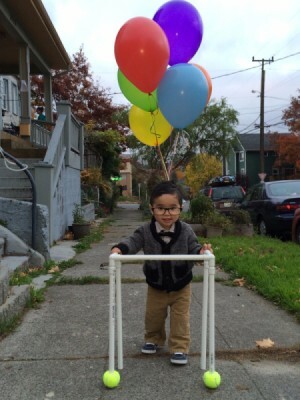 Reconnect with this delightful story by making an "Up" old man Halloween costume for your or your child. My son was the old man from the movie "Up" when he was 16 months old. It was a fairly simple costume to put together. I was really happy with the results. 1 piece to attach the two front legs together, it should be shorter than the length of the legs, but wide enough for your baby to step into. 2 pieces of the same length to attach the front and back legs together. Attach all the pipe pieces together to make the walker. The two 3-way elbows attach the front legs to the front bar as well as the two side bars. The 90-degree elbows attach the back legs to the side bars. I chose not to glue any of the pieces together because I found them to stay together well enough on their own. If you want it to be super sturdy, I would opt to glue everything together. Cut an "X" into the tennis balls and fit them onto the front legs of the walker. There you have it. I wish I would have taken step by step photos, but totally spaced it.